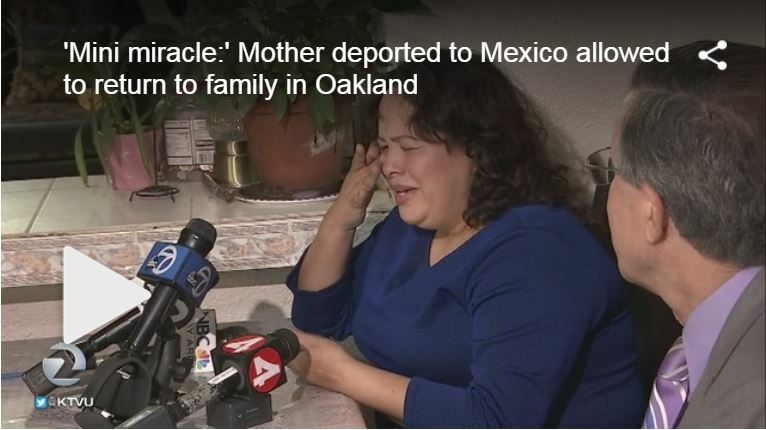 OAKLAND, Calif. (KTVU) – A Mexican mother who had been living in Oakland with her four children for 25 years but was deported 15 months ago was told on Friday that she’d be coming back to the Bay Area as soon as she could. Her story in the Bay Area was covered extensively in the Bay Area she is a loving mother with no criminal record and a longtime nurse at Highland Hospital. Oakland Mayor Libby Schaaf and US Sen. Dianne Feinstein had publicly decried the Trump administration for deporting her. She left three of her children in Oakland, and took her son and husband with her to Mexico in August. According to Mendoza-Sanchez’s Oakland attorney, Carmiel Becker, Mendoza-Sanchez got a call from the U.S. Consulate in Mexico that the United States Citizenship and Immigration Services approved her waiver. The officials invited her to bring her passport to the U.S. consulate in Mexico City so they can issue her a visa and a passport. Mendoza-Sanchez got caught in the Trump Administration’s “no discretion policy,” which means when she left the United States in August 2017 to go back to Mexico, she effectively executed her own deportation order, Becker said. Feeling desperate, Mendoza-Sanchez found legal counsel with Becker, who said he used a “little-known waiver,” called a 212D3, which he’s had success with before. To get this waiver, immigrants must ask employers to file an H1B petition on their behalf. Highland Hospital was happy to do so. There were 200,000 petitions received in this year’s lottery and about a third of those were rejected. “She had a 1 in three chance,” he said. Then, her H1B visa was approved in October. “Someone from up above must have been looking down on her,” he said. Now, with an approved petition, she will apply on Monday for a waiver to her H1B visa at the consulate. There are more hurdles to overcome, such as getting the State Department to review the application for a waiver, which then has to be sent to the Department of Homeland Security. “Normally that process takes months but because of all the media coverage, I think they wanted it off of their docket. They issued a decision this morning,” Becker said. The waiver will allow Mendoza-Sanchez to live in the United States for six years. Becker said there are potential ways to stay longer. But for now, he’s going to celebrate this news and deal with that obstacle down the road.